In the previous blog, I mentioned treating this fear (emetophobia) was two-fold. First, face the fear. This is called exposure. Second, don’t play it safe. This is called response prevention. This is third in the series on helping kids afraid of throwing up or getting sick and will make more sense if you read part 1 and part 2 before you read this. In this post I will do my best to describe response prevention and what to do about it. Response Prevention is the academic phrase for NOT doing something. When anyone gets anxious they try to fix the problem. This is the response. Ironically, sometimes those attempts to fix the problem become part of the problem and make it worse. Response prevention simply means to stop any problematic behavior that is part of the cycle. We have created a supplement to go with the Turnaround program that covers treating emetophobia in detail. These posts are just an overview of the process. I am going to introduce a new term here: safety behavior. Playing it safe is the response that is important to stop. I like this term because it is so descriptive. It means the same thing as avoidant coping that I discussed in part 1 of the series. Avoidant Coping is more descriptive of the principle, while safety behavior describes the function. It can also be generally interchanged with the word “compulsion”. A compulsion is likewise an attempt to solve the anxiety problem by making things safer or less distressing. I don’t mean to be confusing but these terms are nearly interchangeable to some extent: compulsion, safety behavior, and avoidant coping. These are the behaviors that are important to stop, hence the phrase, response prevention. As a quick reminder, remember the anxiety cycle from the first post? Here is the diagram again with safety behavior included. It follows mistaking a trigger for a threat, feeling anxious and then attempting to fix the problem with an action based on a mistaken interpretation. Stopping safety behaviors is generally as important as exposure. Think of it this way: Why would you do something to be safe unless there was a possible danger? A safety behavior assumes danger, threat, or intense distress. So each time you do something “safe” you are reinforcing the belief that something is dangerous. The treatment for this phobia is to prove that vomiting is not dangerous or threatening. Granted it is annoying, but in and of itself, it is NOT dangerous. Playing it safe is supporting the belief there is danger. Make sense? Safety behaviors can be very subtle. Once I was working with a young girl with emetophobia. I was doing it via videoconferencing. I noticed that the exposures were taking longer than expected. That is usually a sign of a safety behavior. I checked back in on this and discovered she would flick her fingers during an exposure out of view of the camera. (It was a way to support “mentally flicking away” the scary image. I am always amazed how clever kids are in figuring ways to cope. Whatever they do only has to help a little bit to become part of the cycle. It can be more symbolic or metaphorical than practical so don’t get alarmed if it seems completely unfounded.) We then worked on doing the exposures as well as reducing and gradually ending the flicking. As I mentioned previously kids will also find other ways of mentally reducing the danger. In part of the exposure process I use pictures. 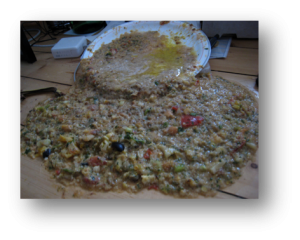 Here is one of the pictures that I used that I eventually pulled out of the rotation because several kids transformed this to “spilled stew” in their mind rather than vomit. (Actually, I think they were probably right.) I will ask periodically, “Are you doing anything that makes it less disgusting like changing the picture in your mind or trying to blank it out?” For example, there is a variation of an anxiety disorder where intrusive violent thoughts come to mind. A common safety behavior for that is to think a “good” thoughts to counter the bad thoughts. One of my adult clients figured out that chewing gum would reduce his nausea. It is so subtle that I didn’t even notice he had it in his mouth until he told me about it. As long as he had gum, he wasn’t fully facing the fear. Again, it hard to not think of this as a good coping behavior since it works. That is the sneaky thing about anxiety. It does help some but it reinforces the idea something is dangerous and so you win a battle but still lose the war. By the way, with emetophobia the physical feelings tend to be either in the stomach area or throat. Watch for spitting, swallowing or changes in posture as attempts to make it safer or feel better. Another subtle safety behavior is the location of the exposures. Being in my office is often a safety. They think, “He wouldn’t do something to make me throw up.” It will likely be the same at home. I will often let safety behaviors continue as we begin the exposure process. It may be needed for a kid to even try the initial exposures. However, I talk about reducing them and bring them up as we discover them. I tend to go back and forth; exposure and then stop the accompanying safety behavior, next exposure, stop any safeties, etc. They also fit in the hierarchy from easier to harder just like the exposures. For example, if my office is “safe” I have them do the exposure at home. If the exposure is saying words like puke and barf, I would ask him or her to start with the safest place at home and work toward the hardest place at home (assuming we determine some places are harder than others). As you could imagine saying, “Puke,” at the kitchen table would probably be harder than in mom and dad’s room. School is often the scariest place to get sick so eventually I will want them to do exposures on the way to school or at school if realistically possible. If cleaning, washing, or disinfecting are safety behaviors then you would want to reduce those as well. I recently went through the main part of the hierarchy with a young boy before we directly addressed some of his safety behaviors. Stopping them would be really hard so they were farther up the hierarchy. So in his case, certain items in his bathroom were “contaminated.” So after he goes to the bathroom and washes his hands he has to touch the contaminated places. We started with the light switch. In his case it was a jack-and-jill bathroom so there was a “clean” switch and a “dirty” switch. He would touch the dirty one and not wash his hands. Next he would do that right before he ate and so on. I am frequently surprised to discover a new safety behavior with a patient. The reason it is hard to discover them is that people don’t think of them as problems but as coping behaviors. It seems so reasonable. 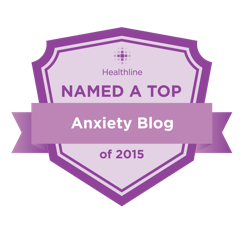 Before I really understood how to treat anxiety, I would help patients come up with ways to cope. I fell right into anxiety’s trap. Much of what I read on the internet is full of these coping skills. I was working with a young man who was avoiding school because he was afraid of getting sick. We went through the whole hierarchy with great success. He is back at school and doing great. There were just a couple things left to tackle. Then it comes out he was scrubbing his desk, chair, pens, pencils every morning with hand sanitizer. Probably the only reason it ever came up is because people were asking him what he was doing. The excessiveness that caused people to comment was a clue that it wasn’t just a preference but a safety behavior. Just to be clear, I don’t ask kids to be unsanitary, at least not permanently. It is perfectly okay to use reasonable care with hygiene. Here is the thing; all that cleaning and washing don’t really provide complete protection anyway. It is more an illusion of safety than actual security. This stuff is microscopic so there is no way to know you get it all when you clean. Nevertheless, kids should wash after going to the bathroom or before meals. My goal is to make the behavior reasonable or normal. If I kid is washing hands 20 times a day or for protracted periods the goal is not to stop it entirely but bring it back to a more normal practice. If you want to gage what is normal do a survey of friends and family and get an average. I will ask the purpose of the behavior. Is the behavior for the purpose of being safe due to the fear or just a good habit? If it is for safety then I will want to modify it at least during the exposure process until the fear is disconnected from the action. A safety behavior will ALWAYS have the purpose of reducing the anxiety. 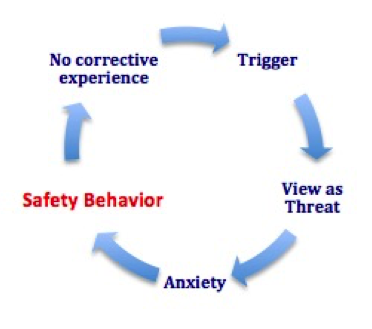 If the behavior isn’t reducing the anxiety then it isn’t a safety behavior and you don’t need to address it. Is Medication the Best Treatment for Child Anxiety? How can parents help their children overcome their fears and handle their anxiety? i was wondering if you thought this program would be beneficial for my 5 year old. he was diagnosed with a general anxiety disorder and i came upon the turnaround program while doing some research. i am wondering if this would be something that he could understand and relate to because he is 5?! We are confident in recommending it for ages 6 – 12. Sometimes 5 year olds do okay with lots of parental help but just as often they aren’t quite ready for it. Thanks for your interest! My 8 year old daughter just started the Turnaround Program. It is great! Her primary anxiety is the fear of throwing up. It has affected her eating tremendously. I am very worried about her not eating enough. Is there a way to integrate getting her to eat more into the exposure process/safety elimination process? Thank you so much! Just wondering if you think this would be an effective at home program for my 9 year old girl. She is not disabled by her fear- not near as bad as some of the stories I have heard. Yet, her fear of vomitting does affect her and her enjoyment of things. It comes & goes but, if there is a trigger, it can really set her off for awhile. I just feel so bad for her- I know she feels helpless and embarrased and gets angry at herself for not just “getting over it”. Thanks so much!